Last night, was a total flop! I got all dolled up for nothing! Got to the club, but the security guard was making a big deal out of my Louis Speedy being too big, so I couldn't come in unless I took it back to my car. I wasn't in the best mood, so I left. Came home and snapped a few shots of my outfit. I love this top from the JET line at Torrid. I got it in a size 3 to have that oversized, slouchy look. 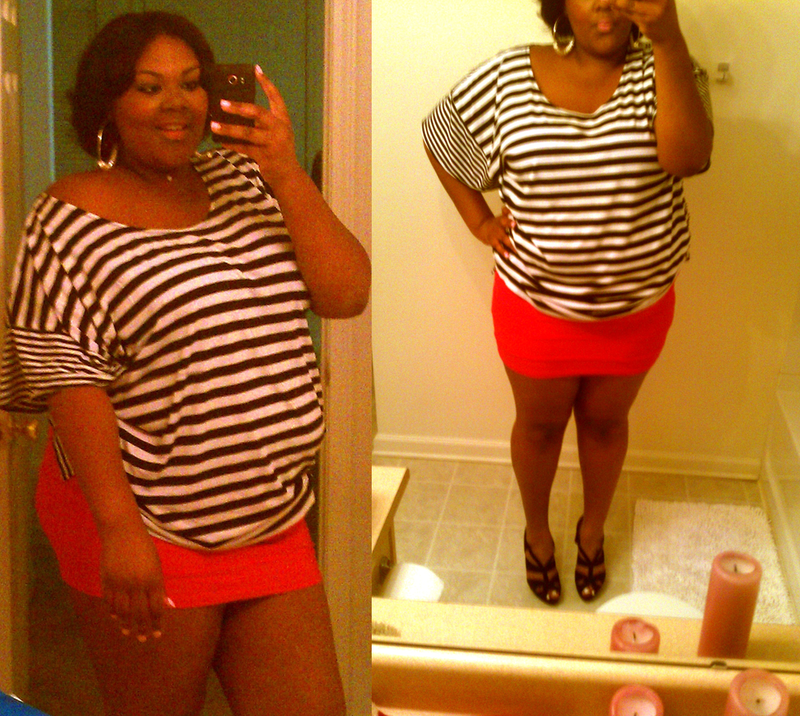 I paired it with a pink bandage H&M skirt, and my black suede Boutique 9 peep-toes. Whoever said big girls can't participate in the oversized trend was a lie. I love it. The earrings are from my line, Belle Boss Jewelry, which will be available mid-September. Please stay tuned for that! I love the slouchy top and that freaking skirt! I can't wait to get a peek at your new line, how exciting! Yea I was totally looking at that shirt recently and I cannot WAIT until your jewelry line comes out!!! psssh that bouncer...what was he thinking? Hotness 100% though. I love your look and I'm glad I clicked thru from FB to check u out! GO 'HEAD MAMA! luv this look :) very cute! Love it!!!!!! 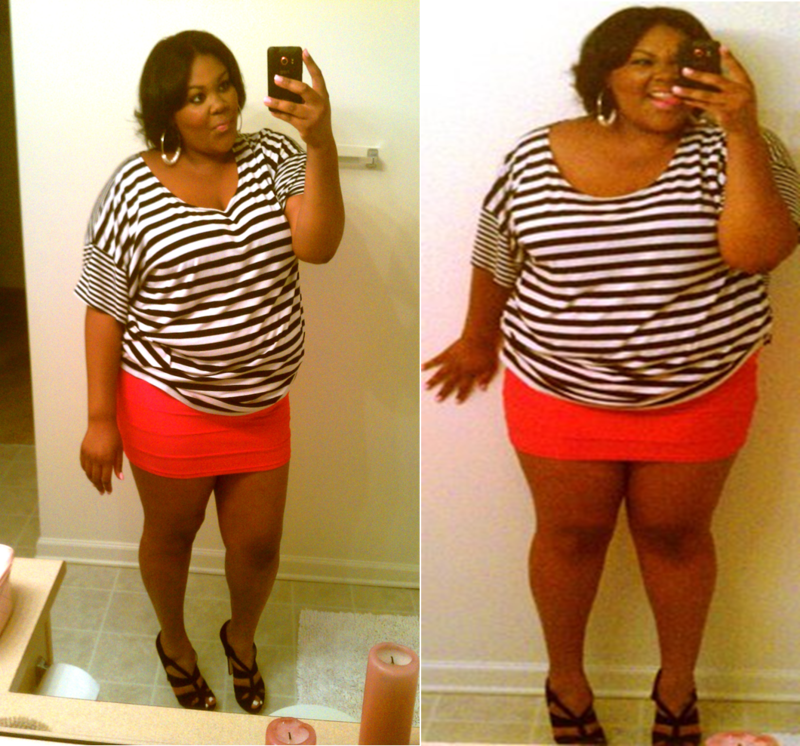 Way 2 work Those STRIPES CHIC!!!! I don't understand why you would want to carry that bag inside a club anyhow? 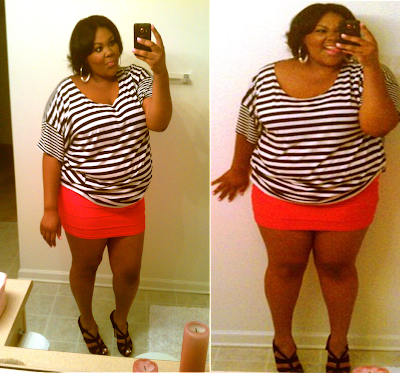 I redid this look for my first blog entry. great combo.